Cheim & Read is pleased to announce a group exhibition of works by a diverse selection of artists, all of whom create artworks configured from multiple parts, sequences or series. Artists included in the show are Lynda Benglis, Louise Bourgeois, Teresita Fernandez, Adam Fuss, Gilbert & George, Jenny Holzer, Roni Horn, Jannis Kounellis, Bruce Nauman, Jack Pierson, John Sonsini and Andy Warhol. Though seemingly dissimilar in subject matter, the works in the exhibit are united by the artists' careful positioning of individual elements in order to create a meaningful whole. The title of the exhibition references Gestalt theory, and the oft-heard statement, "the whole is greater or different than the sum of its parts." While individual elements may have certain implications on their own, combination with other elements will transform the viewer's perception of their significance. Gestalt psychology studies the viewer's innate tendency to create patterns, and to perceive separate parts as pieces of a greater whole. It is in this subconscious grasp at cohesion that the possibilities of meaning lie. The artists in this exhibition effectively exploit language, repetition, and sequence to produce multi-faceted yet unified compositions. Using found pieces of old signage, Jack Pierson separates language into its smallest component—alphabetical letters. The letters, with their sizes, colors and stylistic identities, are evocative on their own; Pierson then reassembles them to create words, the words to create phrases. The work exhibited at Cheim & Read reads "The World is Yours" in multi-hued unity, expanding across 38 feet of wall. Referencing the slogan displayed on an overhead blimp in the movie Scarface, the phrase's significance is certainly much greater than its combination of letters, and is an apt example of the theme of the show. Roni Horn's piece, "When Dickinson shut her eyes: no. 859…", 1993, also employs language, separated in parts, to create a work in which overall meaning is expanded. Each phrase of an Emily Dickinson poem is stenciled plastic on aluminum, in black, on eight separate rectangular units leaned against a wall. Graphic and minimal, the units are physical measurements of the poem; their anthropomorphic relationship with the viewer augments the experience of the piece. 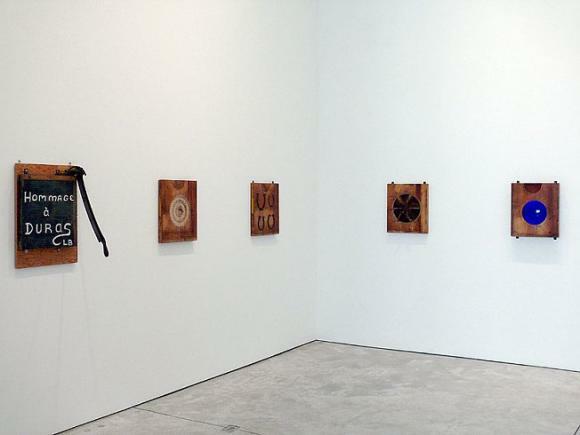 Repetition of similar elements, as in Jannis Kounellis's "Untitled" 1988, provides the viewer with interconnected rhythm. Though the separate elements are still relatively unique, their similarities allow measured navigation through the piece. The repetition of circular shapes in Louise Bourgeois's "Hommage à Duras" 1995, is almost musical, the different rounds like notes of a harmonious score. In Adam Fuss's work, "Adam Fuss, 1961-1973", 2003, repetition of shape is more explicit but equally effective: 105 enamel grave stone plaques are laid out in a grid, their identical oval shapes providing an immediate pattern. Fuss's autobiographical subject provides emotional and nostalgic impact, which is enhanced by the repetition of the plaques. The identification of the plaques' alternate function as grave markers furthers the sense of mortality in the piece. Bruce Nauman's separate images of contorted mouths in "Studies for Holograms" 1970, are unified by their serial layout and their identical format. Jenny Holzer's "Hand Yellow White", 2006, also relies on format to unite the various parts of her subject; the heavily censored, wartime pages of declassified U.S. government documents become that much more haunting in the cool formalism of their presentation. John Sonsini's "The Brooklyn Project", 2007, benefits from sequential arrangement and strict format as well. A pattern emerges in his portrait series of Latino men—two portraits of one individual are followed by one portrait of another, then two and one again. Differences in the rendering of his sitters' faces are made cohesive in their presentation. "The Sum Of Its Parts" brings together a large scope of artists and works, but the show itself is cohesive in its theme. The exhibition's embrace of a multiplicity of subjects and materials examines the ways in which the perception of the whole is indeed greater than the sum of its parts.